This IBM® Redpaper™ publication addresses topics for architects, brand specialists, distributors, resellers, and anyone developing and implementing SAP HANA on IBM Power Systems™ integration, automation, high availability (HA), and disaster recovery (DR) solutions. This book provides documentation to transfer how-to-skills to the technical teams, and documentation to the sales team. This guide describes how to implement an SAP HANA on IBM Power Systems solution from end to end and includes HA and DR guidelines by using theoretical knowledge, field experience, and sample scenarios. 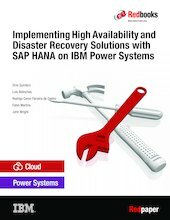 The contents of this book follow the guidelines from SAP regarding HANA installation on IBM Power Systems plus all the preferred practices that are gathered from the experiences of those consultants in hundreds of past HANA installations in customers’ environments. This book is a hands-on guide and is targeted at technical staff who want to install SAP HANA on IBM Power Systems, and also use SAP HANA and IBM Power Systems HA solutions. SAP HANA and SUSE screen captures that are used in this publication belong to their respective owners. The residency team showed them in the publication to demonstrate the implementation and integration parts of the solution with IBM Power Systems.